Dream Theater keyboardist Jordan Rudess has released a lyric video for Wired For Madness pt. 1. It’s the title track from his upcoming solo album, which is set to arrive on April 19 via Music Theories Recordings/Mascot Label Group. Speaking about the sprawling 12-minute song, Rudess says: “The title track Wired For Madness Pt. 1 originally came into existence as an audio experience meant to take the listener on a musical journey. 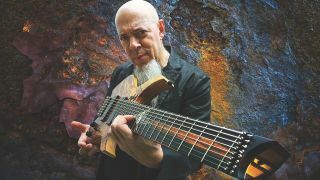 Speaking previously about the record, Rudess revealed: “It’s not a concept album, however the title track, does have a story that I was envisioning while writing it. “The idea was about a guy who wanted to go about a transformational process involving becoming partially computerised and robotic. His functionality as a human was noticeably diminishing and he takes advantage of a modern medical procedure to 'upgrade’ and extend his physical and mental capabilities. “Through the course (or curse) of this process he becomes more and more separated from the outside ‘normal’ world, allowing the computer front end to take over much of his day to day tasks and decisions. Wired For Madness is now available for pre-order – find details below.